So, your paid advertising campaign is doing its job of getting searchers to your landing pages. That’s great, but are your pages doing their job? If a large percentage of people visit them without converting, then they aren't. That's where conversion optimization comes in. If you’re having trouble getting visitors to convert, check out our five tips to optimize your pages for conversions. But, before we get started, let’s define conversion rate. Your conversion rate is the percentage of website visitors who take a specific action, usually responding to your call to action (form fill, phone call, driving directions, purchase, etc.). Just in case you’re wondering what’s normal, the average landing page conversion rate is 2.35 percent across industries. But, we know you can do better than that. Let’s talk about how to improve your conversion rate. 1. Have a strategy and a goal before you start building a page. To be successful at optimizing landing pages for conversions, you'll need to go in with a strategy before you even think about starting to build a page. Don’t leave it all to chance and just hope to build something that looks nice. It might sound crazy, but the creation of a web page (when done by a professional) actually happens closer to the end of the web design process. If you plan out your page's goals and try to design the page around those goals, you'll be successful. If you jump in without a plan, though, this will show on the page. So, hold off on creating the page until you've set goals, defined your target audience and outlined how you'd like the page to look. If you haven't already, create a few personas of your ideal target audience. Keep those personas in mind when building or revamping your website. So, if your business offers tutoring services for college students, your target audience would be college students, their parents, high school seniors, etc. Create a few personas based on your target audience and consider the persona’s goals, pain points and needs. Next, work on your strategy. Figure out what you (or the potential customer) want the page to accomplish as well as what action you want your audience to take. Whatever you want the page to accomplish, make sure it’s obvious in your call to action. Your CTA should be designed to help your audience take that specific action. Once you’ve developed your strategy, you can design and build your page. But don’t jump in before you’ve figured out what your site visitors need as well as your goal for the page. A huge part of conversion optimization is keeping landing pages free of clutter and extraneous information or links. If you took our advice and you have a goal for your page, make sure the goal is obvious to the searcher. You don't want to make it difficult for your site’s visitors to take action. How do you make it easy for landing page visitors to convert? Remove possible distractions. If you have one specific goal, make that goal the one thing the user can do on that particular page. 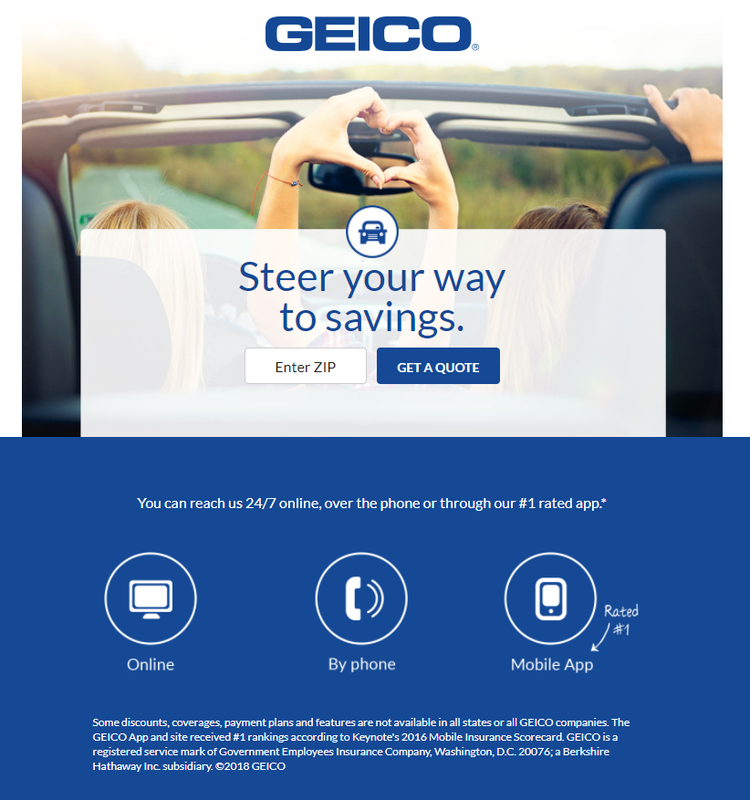 This Geico landing page gives the user one option: get a quote. This is a perfect example of keeping things simple and free of clutter. It's making it very clear what it wants its audience to do, and that makes it easier for the audience to convert. Another thing that Geico does well on this page is its use of color. Make sure to use color wisely on your pages. Too many colors and images will only distract your site visitors. When used correctly, though, color can help increase conversions. We've talked a little about the psychology of color before. When choosing colors for landing pages, you'll want to think about how color affects people. And while we’re at it, white space is also a powerful tool. Just because you aren’t covering every inch of your site with text or images doesn’t mean that space is wasted. White space surrounding a call to action button can help the button stand out and increase conversions. In fact, Basecamp increased conversions by 14% when they decluttered their homepage. Sometimes less is more. White space can help frame the important elements of your landing page. Any time you want to change something on your landing page, A/B test it. A/B testing involves testing two options. If you want more website visitors to fill out a form on your page, you could test adding or removing one of the form’s fields to see if the change increases conversions. You can A/B test headlines, landing page design, button design, call to action copy, or pretty much any other part of a page. A/B testing new page elements allows you to see how the changes affect your conversion rates. Sure, we could throw some statistics at you about how one A/B test helped one company increase conversions by just changing the color of their call to action button, but A/B testing is the way for you to figure out what works for your website. I’m sure you already know how important mobile optimization is. But in case you need some convincing, mobile internet usage has surpassed desktop. And 60 percent of consumers use mobile exclusively to make purchase decisions. Mobile shoppers also convert 160% more often on mobile-optimized sites. Along the same lines, speed is important, both on mobile devices and on desktop – 73 percent of users say they’ve used a website that was too slow. And 40 percent will leave the page if it takes longer than three seconds to load. So, don’t just optimize your site for mobile. Make sure it loads and responds quickly on desktop as well as mobile devices. You probably already know that adding reviews to your website can increase trust in your business, but it can also boost the conversion rate of your landing pages. Here’s why your landing pages need reviews. Bonus: in one case study, adding a photo of the reviewer increased conversions by 22 percent. When sharing reviews, consider a review feed of aggregated reviews from review websites and listings rather than plain text reviews since search engines can't always effectively index those text-based testimonials. Click here to learn more about our paid advertising services.